Jerry Velona was born in Jersey City and grew up in Bergen County, New Jersey. He was raised in a family of musicians and began playing violin and piano at the age of 8. Jerry eventually took up drums and guitar and spent a good deal of his high school years playing in bands throughout northern New Jersey. After working at several of his father’s bowling alleys, he moved to Boston to attend Berklee College of Music. 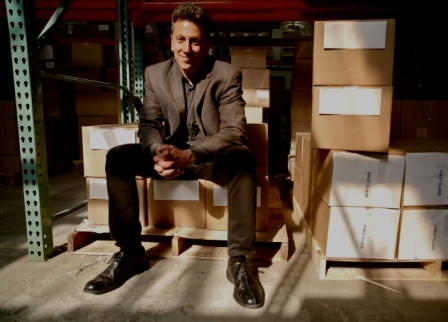 “A lot of people see that I attended Berklee and wonder how I ended up owning part of an envelope company. I tell them I have no explanation for how that happened,” Jerry laughed. After leaving Quik-Stik, Jerry took a job in the purchasing department of the recently created Mutual Advisory Corporation (MAC) which was a visionary group formed by a group of Massachusetts savings banks looking to consolidate many of their common functions in a single service bureau. The MAC group created one of the first ATM networks in the state called “The Redi-Banks”. Jerry eventually became the manager of purchasing and marketing for this holding company which served banks with assets in excess of $2 billion. The MAC group eventually decided to concentrate on other things so Jerry took a sales job with one of his vendors, Northeastern Envelope Manufacturing. He worked under company owner Jerry Mitchell and learned the envelope industry from one of its most experienced and knowledgeable professionals. “I had little prior sales experience but Jerry felt I was worth the risk I guess”, he said. At Northeastern, Jerry met and worked with his future partner Dave Theriault. Starting from scratch, he built a sales portfolio of over $2.5 million and eventually became sales manager when Northeastern was purchased by Mailwell Envelope. Sensing that Mailwell was going to close Northeastern due to its own financial problems, (they eventually did so in early 2003) Jerry left and worked for one of Northeastern’s competitors for a couple of years before starting Elite Envelope along with partner Dave Theriault in December of 2003. Elite has grown from the founding three of Jerry, Dave and Tracie Theriault to employ nearly 30 staff. The company purchased a 24,000 square foot facility in Randolph, MA in late 2008 where it currently resides. In September 2012, Elite merged with Web Corp; a cold web printer also located in Randolph. “We saw the Web Corp merger/acquisition as an opportunity to strengthen our core business by adding a complementary product which would be of benefit to our customers,” he said. Jerry's handles most of the sales and all of the marketing for Elite in addition other functions. "Dave and I made a decision early-on to keep an active role as owners as well as keep us lean at the top. As a result, Dave, Tracie and I all wear many hats in addition to having daily contact with our customers who have no doubt where the buck stops and are not shy about informing us of that fact, " Jerry laughs. Jerry’s music career has continued alongside his business ventures. He has released 5 CDs of original music. His songs have been used in HBO and MTV shows and have received airplay on stations across the country and in Europe. He sings and plays locally with various artists as well as his own bands, Joint Venture and Pack of Viceroys. Jerry enjoys all types of sports and fitness activities (including his most recent obsession, paddle-boarding), as well as reading, writing, movies, politics, travel and spending time with his family. He has three children, four grandchildren and resides in Arlington, MA.